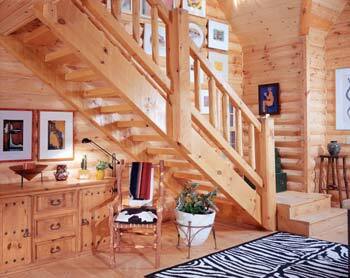 Learn how to integrate your personal style into the interior design of your log home. For months (or maybe years), you’ve been dreaming about and planning your perfect home. While perusing the Internet, magazines and model homes, you may have noted specific spaces that pushed the boundaries between architecture and personal style. This progression of personal interior design has evolved from both a need for practical design and the desire to individualize each space. As the trend toward downsizing square footage while loading homes with much-desired amenities becomes more standard, you’ll want to use all the nooks and crannies of your home to their fullest potential. 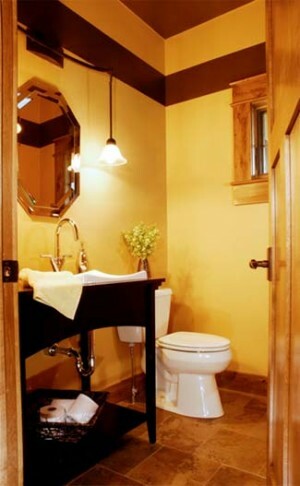 Simple touches such as greenery above the commode or an elegant mirror can make a big impact. Short on space in the powder room? Make unique materials the focus. Even the tiniest half-bath can achieve a luxurious feel when you mix materials and decorating schemes. Forego traditional cabinetry for recycled or antique pieces (or design your own! ), and integrate a one of-a-kind washbasin into the top. Lofts seem to be one space log-home owners can't live without. Whether you'll use your loft as an office, den, sleeping quarters, entertainment area or just a little corner to relax in, plan this space well in advance to get the most out of it. With a little thought and creativity, even the smallest loft can be transformed into the ultimate retreat. How should you decorate your left? Well, what are your hobbies? Make this space a reflection of your personal interests. If you could have a "getaway" space where you can do whatever it is that you love to do—then make it a reality with your loft! If you spend a lot of time in the kitchen, this is the perfect place to make each inch count. Custom cabinet design ideas are limitless, making it easy to design specialized workstations that meet your day-to day cooking needs. (Use fresh produce all the time? Embed a customized cutting board next to your sink.) Baking and indoor grilling stations are very popular these days, and since the kitchen is now the hub of the home, consider setting aside a corner of your kitchen for a mini-office or electronic charging and message center. Make your open rooms live larger by looking for spaces that can pull double duty. A cabinet on the end of an island can double as an entertainment area, eliminating the standard dilemma of where the put the TV. A banquette can transform an ordinary eat-in kitchen into a casual yet intimate dining space that's chock full of storage. Don't forget about out-of-the-way spaces such as the one shown here. In a small cabin, a spot under the stairs, in an underutilized corner of a kitchen or in a rarely visited guest bedroom can become prime real estate for a home office or storage space. The underside of an open staircase is a great space for furniture, and can double as a welcome center or even hold a writing desk. Bookcases, cabinetry and seating niches are all great ways to maximize both form and function here. If decorating these spaces seems like an overwhelming task, or you don't know how to best narrow down your choices, enlist some professional help. Aside from developing your ideas, a professional interior designer can simplify the process and make sense of the myriad materials and choices on the market today.